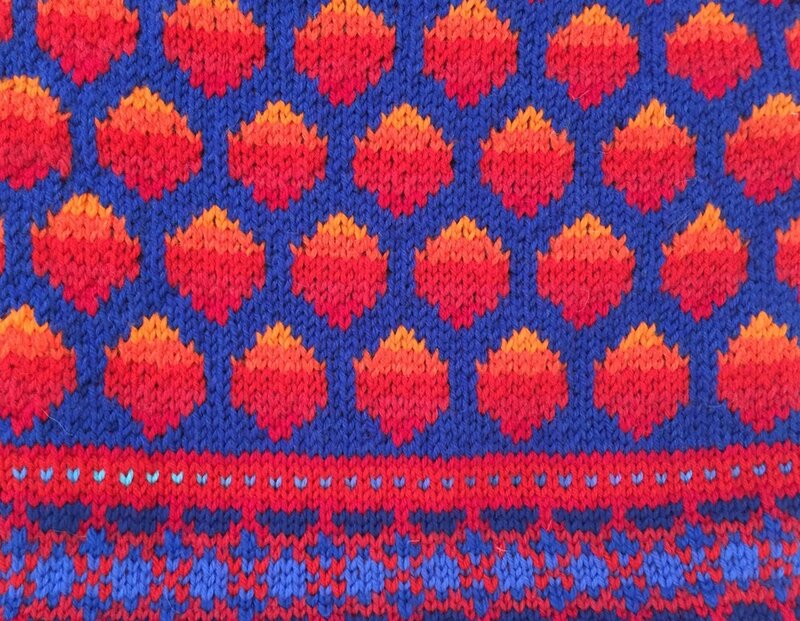 This is a very colorful sweater, playing with deep blue and the colors of fire. The "circles" change from dark red to gold. The wrist and hem trim flips the body of the sweater, with blues changing against a background of red. The neck, wrists, and hem also have trim in variegated blue and dark red. This is a smaller version of the Saskia Dancer sweater (Nine Years), in periwinkle and white. A dancer is surrounded by swirls. The sleeves have one dancer again with swirls. The wrists and hem trim is a pattern of red to yellow on a background of green. The neck, wrists, and hem have picot trim in alternating stripes of green and red to yellow. A variation of the Dancer sweater, with just one dancer and rows of stars. The body of the sweater is red and white, with an inset of pink and white diamonds. The wrists and hem trim is an abstract pattern in dark red and varying greens. The hem has a bell type of lace. The neck and wrists have a simple picot trim in dark green. This is the only picture I have of this version. I love the combination of blue and white! Two reindeer stand under a shelter and streaming stars, in white on periwinkle. The mirrored sleeves have one reindeer under stars. 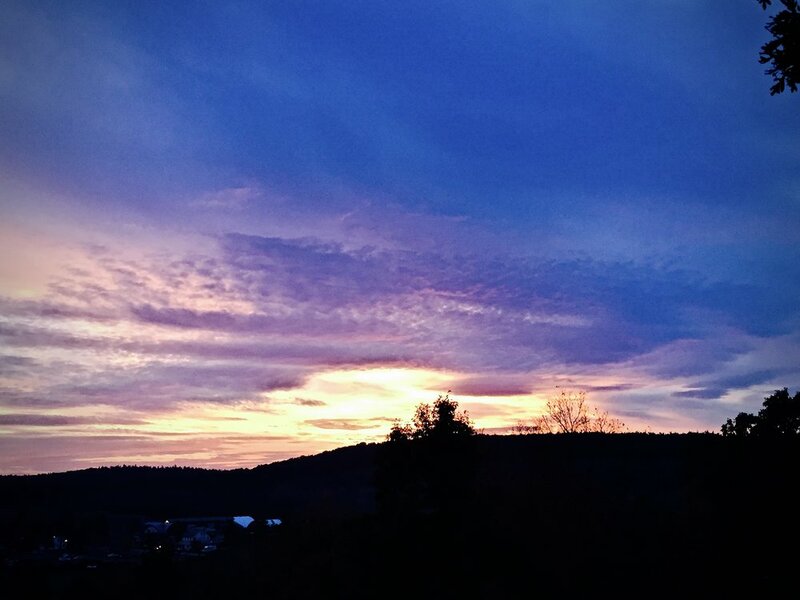 The wrists and hem trim is dark green trees against a dawning orange sky. The neck, wrists, and hem trim is alternating stripes of dark blue and red to yellow. In this variation, the blue is deeper. There are curls of smoke exiting the chimney of the shelter, and the sky is full of stars. The sleeves are the same as the body of the sweater. 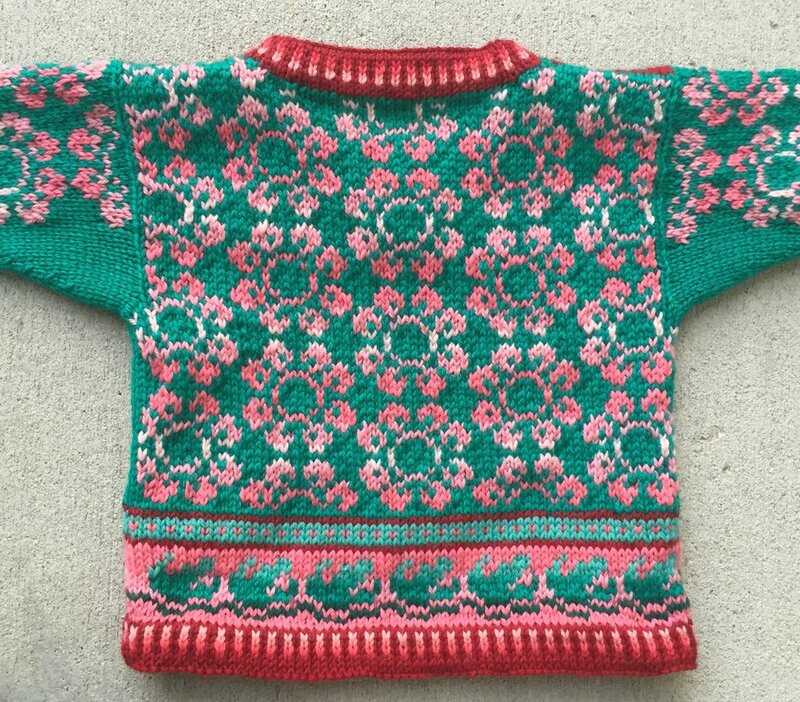 This is a simple Roses sweater, with varying dark red to peach roses against a background of green. The wrists and hem trim is vining leaves of dark green against a background of bright red. The neck, wrists, and hem trim is alternating stripes of red and greens. I also tried a very swirly edging everywhere, which I don't think really works. Another exploration of the green background and red flowers theme. 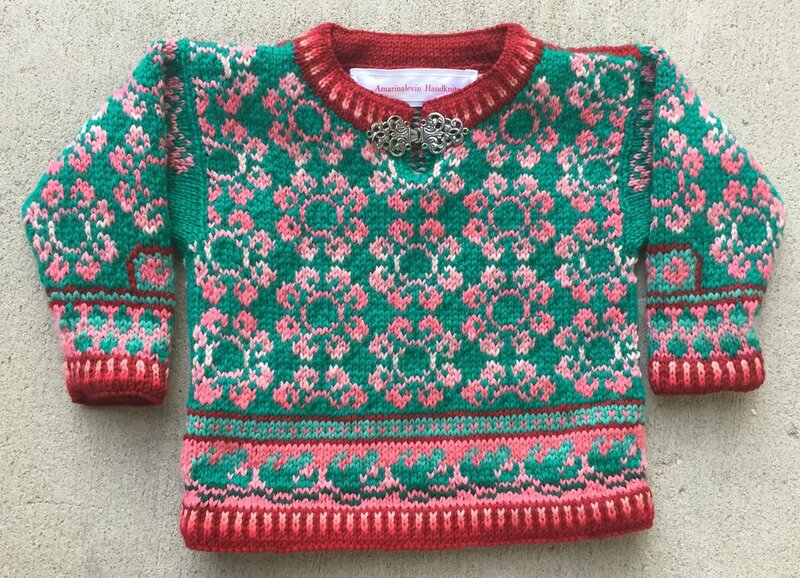 This sweater is round flowers in peachy colors on a green background. At the wrists and hem are three trims. The wrists and hem trim is varied green leaves on a peachy background. Another trim is a simple peach dot on a light green background. The neck, wrists and hem trim is alternating stripes of dark red and varying pinks. There is a placket at the front neck held closed with a pewter clasp. The sleeves have the same round flowers pattern, with a tiny variation at the beginning of the trim patterns. And yet another variation on the pink/red flowers on a green background! The wrists and hem trim is also a variation of varying green vining leaves on a varying pink to peach background. The neck, wrists, and hem trim is alternating stripes of red and greens. A very simple sweater of white stylized snowflakes against a dark blue background. The wrists and hem trim is simple dark blue diamonds against a red background. The neck, wrists, and hem trim is alternating stripes of dark red and varying blues.